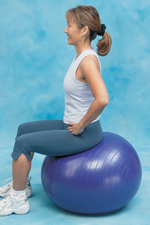 The Norco Balance Bubble encourages upright posture, stability and balance. This balance disc responds to small movements and trains the muscles of the spinal column by using the body's constant unconscious effort to stay in balance. Use while sitting, standing or kneeling for balance exercises to strengthen back, leg and foot muscles. The blue vinyl cushion measures 14 in diameter. Latex free. Supports up to 1000 lbs.